The YBB is set to bring a little Wyoming to Cabo San Lucas! 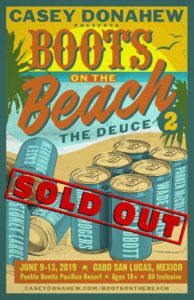 The band is excited to join the lineup at this year’s Boots on the Beach, presented by Casey Donahew & Friends. Other acts include Josh Abott, Parker Mccollum, Randy Rogers, Stoney Larue, and Wade Bowen. This is a party you won’t want to miss!